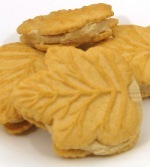 Our pure maple candy is made from pure maple syrup, harvested in northern Vermont. Each gift box contains 24 pieces of candy. If you're looking for corporate gift ideas, this candy box is one of our best-sellers! The only problem with this gift is that the candies probably will not make it home from the office before they are gone - they are that good! If you don't see what you're looking for below, any of our Gifts can be used as “corporate gifts”. 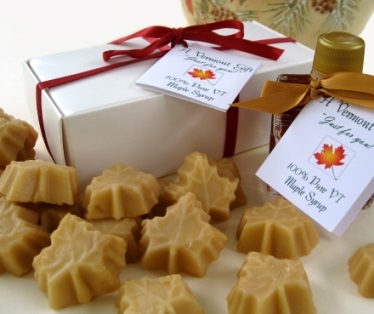 Once you've selected a corporate gift, email us at candy@maplecandyvt.com for Volume Pricing. The Ribbon & Custom Tag - White pop-top gift box is wrapped with a 3/8" wide red or burgundy ribbon, and includes our custom tag, on which is printed, "A Vermont Gift. Just For You." Other ribbon colors are available, simply give us a call. There's also an orange maple leaf printed on the front as well. Inside the tag we'll also carefully hand-write your gift message.